“Arriving flight 1529, 7:30 p.m.” The Holboke family had been waiting for those words. They loaded into their car that evening and headed to the Portland, OR, airport to meet their new dog, Simone, soon to be named Macy. “We lost our old Boykin Spaniel in October, and our 10-year-old twins, Kate and Will, had never known a day without a dog,” says Janet Holboke. It wasn’t long before Kate went on Petfinder to find a puppy to adopt. Macy traveled many miles to find her happy home. What drew her attention, though, was not a puppy at all. It was a two-year-old dog that had been found with a rope whose neck had grown into her neck. She’d been full of fleas and badly neglected when rescued, but now was in a CARE foster home in Texas. Kate knew this dog needed a family – their family. They contacted CARE and learned more about Macy, and after undergoing a rigorous adoption process, arrangements were made to transport her to Oregon where the Holbokes live. And now she was there at the cargo gate, peering at them through the front of a dog crate. They clipped the zip ties that secured it, and out she came. It took her longer to warm up to Mr. Holboke – Jon — perhaps because of a negative experience with men in her past. She runs away from anyone carrying a stick, and X-rays later revealed she had BBs embedded in her body. “As she has adjusted to our home, she has learned that Jon is a great guy, that cats are best when looked at but not approached, and that walks and car rides are wonderful!” Janet says. They soon learned that she has an empathetic nature. “A few days after she arrived, one of our Girl Scouts survived a house fire and came to our meeting, still in shock. Macy lay next to her the whole meeting, without prompting, nuzzling and snuggling,” Janet says. She has also brightened some days by snuggling with some of the residents at a nursing home. 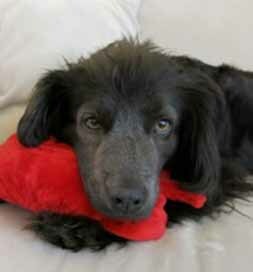 At last, Macy has a loving home that can help her forget her horrific past.